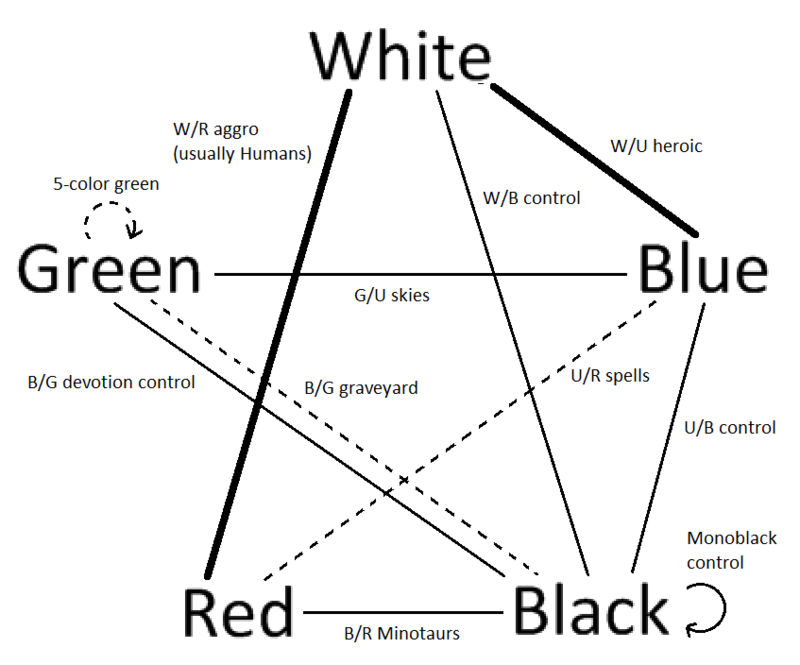 If we take all the archetypes discussed in my post summarizing archetypes in Theros draft and plot them on a color wheel, this is what we get. A line between 2 colors indicates that there is an archetype that spans those 2 colors (monocolor and 5-color decks are indicated by an arrow from the color to itself), and is labeled with the archetype name. A thick line indicates that the archetype is more likely to come together in a draft because it relies on fewer key cards, requires fewer uncommons/rares, or shares cards with fewer other archetypes; these are the archetypes that were bolded in that post and can usually support 2 drafters at an 8-man draft. Archetypes that rely on specific rares, require multiple copies of a common/uncommon in order to function, or that share cards with multiple other archetypes are riskier to attempt and are indicated with thinner lines; these archetypes can usually support 1 drafter per table. Archetypes that I haven’t drafted yet are indicated with a dashed line; these usually won’t have any drafters since they need multiple uncommons/rares in order to function. If you want to read more about a particular archetype, that post has a list of the key cards for each archetype and links to more detailed descriptions. The purpose of the archetype wheel is to help us see visually which colors support the most number of archetypes and, therefore, offer the most flexibility. This can help when choosing between 2 cards of similar power levels in the early stages of a draft. For instance, black supports the most number of color combinations and can be paired with any of the other colors, or be played on its own if you get enough black cards. However, most of the B/X decks are similar and rely on the same core of black cards, so you have to compete more with players for those key cards. Green allows the least number of color combinations and so offers the least flexibility; this is one of the reasons it is the least popular color in Theros. Note that white can support more drafters than it might seem because W/U and W/R can often support 2 drafters each. This means that you should consider taking a white or black card over a blue or red card of equal quality early in a draft, and that you should avoid taking a green card unless it’s a bomb. This means that a typical draft will have 6 aggro decks and only 2 control decks. There will usually be 4-5 white decks, 3-4 blue decks, 3 black decks, 3 red decks, and 1-2 green decks. White and red only appear in 1 control deck each, W/B control and U/R spells respectively, and the latter is unlikely to come together in most drafts, so you don’t usually want to use early picks to take control cards in those colors. There’s also only 1 black aggro deck (B/R Minotaurs), so you don’t usually want to use early picks to take aggressive cards in those colors.